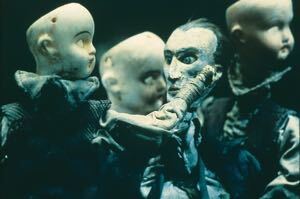 Talking to the Quay Brothers is a lot of fun. Maybe it’s the bottles of Prosecco sitting in the middle of the table in which they’ve been imbibing or maybe it’s the fact that they devilishly grin when you ask which is which, further heightening the mystique surrounding them. Then again, “fun” is not exactly what you might expect from the identical twins Stephen and Timothy who have been making dark and moody stop-motion animated shorts for thirty-six years. Their distinctive style of animation has set them apart from other stop-motion animators, although their influence has also been fairly widespread, made more obvious by the fact that their films are being brought back into the spotlight by no less than filmmaker Christopher Nolan, who has assembled a touring package of their shorts called “The Quay Brothers in 35MM” which includes his own documentary short “Quay” that goes behind the scenes into the brothers’ animation studio. The show just premiered at the Film Forum in New York this past Wednesday along with three of their shorts: “The Comb (From the Museums of Sleep),” 2000’s “In Absentia” and one of their best known works, 1986’s “Street of Crocodiles,” and ComingSoon.net met with the Quays in the offices above Film Forum. Because we never knew which was which—one did most of the talking but the other would chime in with words/thoughts and finish sentences, much like you’d expect from twin brothers—we’re going to attribute all the quotes to both of them. Even with the advances in technology, they’ve still used many of the same techniques they’ve always used, often referencing the silent film era and using techniques like matte painting for backgrounds. 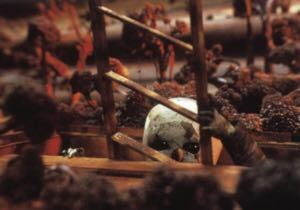 They do shoot everything organically using stop motion but then use modern technology to composite the work. “It could be a powerful antidote to certain kinds of cinema that something like this will drift into your town like a tumbleweed,” they joked when it was suggested that them traveling with the tour would make it more interesting. “You have a chance to see it and then it rolls onto the next venue. Nolan’s Syncopy production company is also working with Zeitgeist to release “The Quay Brothers: Collected Short Films” for the first time ever on Blu-ray on October 20, which will include “Quay” and a couple more recent shorts, but leading up to that, fans of their work can go to one of the 11 cities on the tour where the three short films can be seen on brand new 35mm prints, the way they were originally filmed. It will continue on at the Film Forum until August 25, but you can see the full line-up of where “The Quay Brothers in 35mm” will play over the next couple months on the Official Zeitgeist Site.